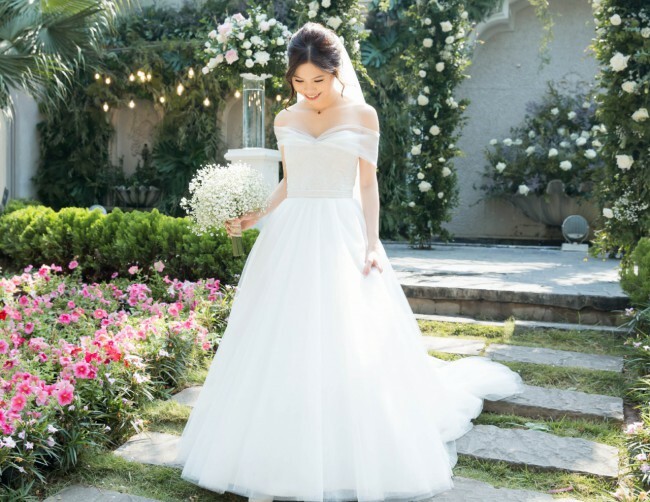 I am selling my beloved wedding dress which was worn once on my wedding day only 3 months ago (November 2018). The dress has been professionally dry cleaned and kept in a perfect condition. This beautiful dress is made by Karen Willis Holmes who is known for their timeless, elegant designs and excellent craftsmanship. I have chosen the Demi bodice with Organza collar and Franki skirt with Embellished belt from their Bespoke Collection. The soft and dreamy tulle of the Franki skirt makes this dress extremely light and flowing. The classic off-shoulder A-line design also makes it a versatile dress that will look stunning in both indoor and outdoor venues. The dress took 6 months to make and I was very pleased with the final product. In regards of sizing, the dress is originally a 6 AUS. Since I am quite petite, I had it slightly altered by a KWH tailor to fit me better. For your information, I am 1m63, a 4 AUS/UK, 0 US and XS in most brands. I believe this gorgeous dress will suit a petite bride who loves a classic, elegant look with handcrafted details. I personally had a hard time looking for a wedding gown that actually fits and flatters my petite frame. Hopefully this dress can save you that hassle and even a few hundreds on alteration. I live in Sydney, Australia. If you are also in the area you are welcome to visit and try on the dress in person. Price is negotiable and veil can be included with the dress if you are interested. For any question, please feel free to contact me and I will be very happy to assist.